The Eastern Red-backed Salamander is long and slender. There are two different colour phases. The more typical is black or dark gray with a broad, straight-edged stripe from the top of the head down the back and onto the tail. This stripe is usually red or orange but may be yellow, pink or gray. Less common is the "leadback" form which lacks the stripe. Both forms have black and white mottling on the belly. The Western Red-backed Salamander is almost identical but has black and white flecking on the belly rather than mottling. It is restricted to western North America. In eastern Canada, the Allegheny Mountain Dusky Salamander can look similar but always has a pale bar from the eye to the corner of the mouth and often has dark V's down the centre of the back. In the Northern Two-lined Salamander the stripe down the back always has a dark line on either side. The Eastern Red-backed Salamander is widely distributed in the Great Lakes-St. Lawrence Basin and eastern maritime states and provinces. It is found in southern Ontario and Quebec as well as New Brunswick, Nova Scotia and Prince Edward Island. It is found as far south as North Carolina. 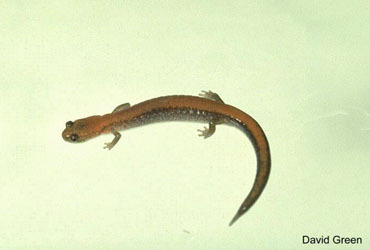 Eastern Red-backed Salamanders are most commonly found in deciduous or mixed forests, although they are sometimes found in cool moist white pine or northern hemlock forests. They are restricted to mature woodlands with lots of fallen logs and coarse woody debris. Breeding usually occurs in the fall but may take place in the spring. Young females breed in their third year and may only breed in alternate years after that. From 3-13 eggs are laid in June or July in a rotting stump or log. The female tends the eggs for six to eight weeks and the young hatchlings for one to three weeks. When the young first hatch they have small gills but these are soon resorbed and the young then resemble the adults. Eastern Red-backed Salamanders defend small territories from other salamanders and tend to wander very little. In some sites they can be extremely abundant, outnumbering birds and small mammals. They may hibernate underground, in the dens of small mammals or even in ant mounds. There is no evidence of decline in this species.